Whether you have a winter wedding coming up and still haven’t chosen flowers for it, or you’re planning a wedding for next year at this time, we have some winter flower arrangement ideas you might love. Winter is a fun time for displaying flowers because there are so many types you can put on show, which means there’s an abundance of combinations of blooms that can offer elegance, warmth, or winter cheer – whatever feeling you want to convey at your wedding. You can go with a holiday theme with your winter wedding flowers and incorporate traditional plants like holly, poinsettias, and paper whites in your arrangements. Or, you can bring some color into a chilly and white winter season by using bright and bold orchids, lilies, and daises. It would also look stunning to have a mix of white flowers in your winter wedding arrangements, flowers of any type you like to show off a winter wonderland kind of look. As you plan for your winter wedding flowers, we think the following floral combinations would bring a gorgeous, seasonal flair to your celebration. For a Christmas-themed floral display, think about featuring traditional holiday flowers in your tabletop arrangements, bridal bouquet, and bridesmaid’s bouquets, along with some non-flowering Christmas plants. We think arrangements of holly and evergreen boughs, paper whites, and white lilies mixed with pinecones and berzelia berries would be wonderful. Bridal and bridesmaids’ bouquets of white calla lilies, white orchids, and white carnations, combined with eucalyptus pods, silver brunia, and dusty miller, make for a lovely natural and simply perfect winter flower display. Winter flower arrangements made of red or white orchids, Asiatic lilies, roses, and dark greenery make for beautiful and dramatic displays for evening weddings. To make these arrangements more sensual, consider incorporating berries and a few sprigs of silver-touched greenery. These are just a few of the many winter flower arrangements that will surely impress and delight your wedding guests, and you – the star of the wedding ceremony! 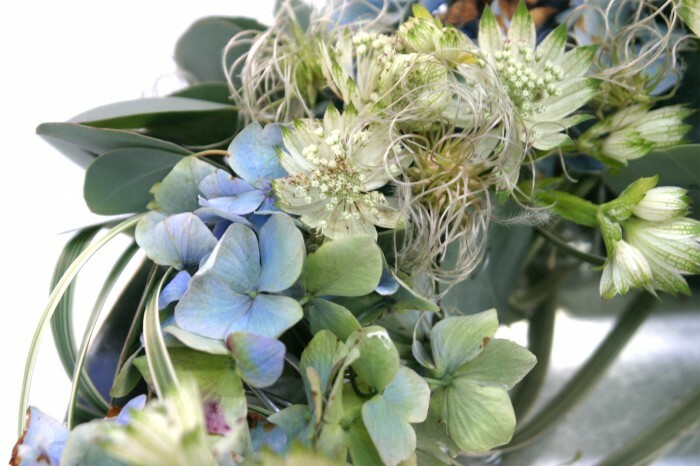 A few other winter wedding flowers you can throw into the mix include scabiosa, viburnum berries, ranunculus, and anemone. Whether you have a winter wedding coming up and still haven’t chosen flowers for it, or you’re planning a wedding for next year at this time, we have some winter flower arrangement ideas you might love.Winter is a fun time for displaying flowers because there are so many types you can put on show, which means there’s an abundance of combinations of blooms that can offer elegance, warmth, or winter cheer – whatever feeling you want to convey at your wedding.